Vacation rental cottage. Sleeps 2, 1 bedroom, 1 bathroom. Dogs allowed. Perched under soaring cypress trees and looking across the bay toward Mendocino Village, lay the inviting and accommodating Chapman Point Cottage. Just minutes from town and the beach, this loft-style suite is the perfect launch pad for your Mendocino adventures and a welcoming haven for those in need of a respite. Made from reclaimed redwood, with vaulted ceilings and a spacious floor plan, Chapman Point Cottage manages to provide its guests a cozy and intimate stay with plenty of room to stretch out and relax. The living room is very comfortable with a plush sofa and a huge chaise lounger, and an entertainment center featuring a 42' wide screen TV, Blu Ray player & Wi-Fi. Adjacent is the full sized-kitchen with everything you need to cook a world-class meal. Upstairs, from the bedroom-loft, there's a modest view of the Bay and beyond, Mendocino Village in the distance, as theatrical as a painted backdrop - pretty on a calm day, dramatic in a storm when the waves crash against the rocky bluffs. Spend the day perusing Mendocino Village's shops and attractions, take in the sun at Big River Beach or clear your mind with a walk across the scenic bluffs at Spring Ranch Park, which is just a few minutes walk from your door. Whatever you choose to do, you can rest assured that Chapman Point Cottage is nearby, ready to be your home away from home. No children under 10 yrs. old, infants may be considered. Rooms Sleeps 2, Bedroom is located in a loft area with a minimal bay and village view. The primary view is of a garden area. This was an amazing place! We loved EVERYTHING about it.... pellet stove, jacuzzi, views, grounds, and interior. The management of the property were also incredible! Overall a wonderful getaway. Will definitely be back!!! We encountered a little bad luck when we first arrived, everyone we spoke with at the office was friendly & professional & any issues were addressed right away. We were celebrating my husband's 51st birthday & our 13th anniversary. There were birthday & anniversary flyers waiting for us upon arrival, very special! Overall we had a wonderful time & will definitely be back! Overall we had a good experience at the vacation rental in the cottage. The location was super convenient to both Mendocino as well as Ft. Bragg. The cabin was spacious and clean upon arrival. I was glad we'd brought food and other spices, oils and basics from home so we didn't have to buy them again. The heater worked really well as did the hot tub. It seems like you can walk down to the water from the place, but there is another, larger home right in front on the same property, so ocean access is blocked. I've been to Chapman Point Cottage several times over the years. Its location is outstanding. Just across the bay from town. Very quite. The site is always clean and people in the area very friendly. I will return again. The cottage is a wonderful, quiet, cozy, romantic setting with nice views of Mendocino's peninsula. In the morning, you can hear the ocean's waves lapping up on the shore. It is about a 3 minute drive to Mendocino and about 7 minutes to Little River. It is a beautiful little building, great light and the hot tub is super! Fully equipped kitchen if you want to play chef, and close enough to awesome dining if you want to eat out. The pellet stove is great, and helps keep the morning chill at bay. The only suggestion - the road sign is super hard to see, particularly at night - if there is any way to have additional signage on Hwy 1. Other than that, it was a terrific weekend and wonderful stay. Great little cottage, but very spacious feeling. Had everything needed to cook up a meal. Best of all so close to town why cook order out. Perfect retreat, with beautiful cypress garden. Really enjoyed the cottage...very quiet and clean. Beautiful and fully functional. Waking up in the morning felt as if you were in a tree house in the forest. Love this place. As always, we wish we just owned it outright and could make it over much more often. This is our favorite vacation rental we've ever had, and are SO spoiled, that it colored our experience for a nice home we rented last summer in the Sierra Foothills. There, we had to take our own sheets and towels, paper towels, even the TP! SO nice to just walk in and start our escape at Chapman Cottage! Selfishly, we don't want to recommend this place so that it is always available when WE want it! Perfect location, great house in perfect condition. Mendocino preferred is TOP NOTCH! I've enjoyed their clients properties for over a decade at four different sites in or around Mendocino. Chapman Point Cottage is one of my favorites. Convenient to all local sites, perfect for one/or two. Winter, Summer, Spring or Fall...this is one spot to just sit down and let the World go bye. We loved our stay at Chapman Point Cottage. The location is great. The amenities are exactly as described. Great kitchen. Clearly the owners want to make everyone who stays here very comfortable. Totally relaxing but does have TV. wifi, etc so that one can keep in touch with the outside world when desired. The Chapman Point Cottage was perfect for a long weekend getaway! The house was very clean and in a perfect location for local hikes, canoeing, and Mendocino restaurants. 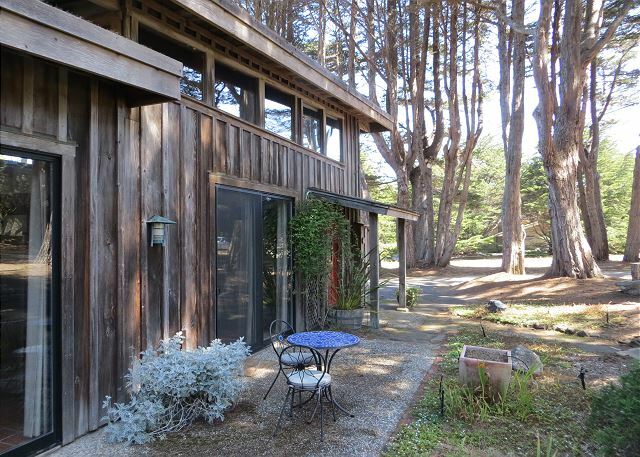 This cottage is located south of Mendocino bay. It is a rustic and comfortable location. There is a view of the ocean and of Mendocino, but only if you stand at an upstairs window (on your toes if you are short) and look around another house. (We were not misled into thinking the view was better.) The charm of the property is that it is a nice, unique, cozy place to spend a few days while visiting the Mendocino coast. The furnishings are older but in good condition. The bathroom and kitchen are up-to-date and nicely stocked. The queen bed is comfortable. My only wish for a change would be to have a bathroom on the same level as the bedroom, which is an upstairs loft. We have stayed here twice and will most likely return. Yet again this place was amazing. So warm and cozy and so close to shopping and yummy food. This is our 3rd time and there will be a 4th and 5th for sure! The house is beautiful - the photos do not do it justice. Excellent proximity to state parks and the town of Mendocino. I've used this cottage many times. Always a favorite. Near-by to everything: hiking, diving, fishing, and town! Lots of places to visit and beauty to seen. The property is always clean and ready upon arrival. A great place to relax and slow-down. I love it! Our first time at Chapman Point Cottage but we've stayed at other nearby properties before. The team at Mendocino Preferred was great with special touches for our anniversary. The Cottage is very spacious with plenty of space for the two of us, and nicely located at the end of a private road. It is behind the larger Chapman Point House so you don't really have a direct view of the ocean but you can hear it. The location is directly adjacent to the Spring Ranch extension to Van Damme State Park which is wonderful for hiking. Wonderful stay! Both the house and cottage were immaculately clean. There were enough supplies, including coffee! for the first day. The view from the house is stunning; both from the great room and kitchen as well as the master bedroom. The area is quiet, secluded, beautiful. The homes are both clean, comfortable, homey, and the perfect place for a family vacation. Highly recommended, and we plan to return! My wife and I (and our pup) came to Mendocino for the first time for a romantic mid-week getaway. Chapman Point Cottage was everything we wanted... spacious, relatively private, and beautiful. We couldn't have asked for a better vacation! We loved out stay at Chapman Point Cottage and would definitely stay here again. A charming place, beautifully appointed with a great kitchen for cooking. The hosts thought of everything and the location was perfectly situated close enough to town but far enough to feel like you were in the woods. This is our second time at the ChapmanPoint House. We love the location and the property..the expansive floor to ceiling windows overlooking the bay, the spacious living/dining/kitchen space and comfortable bedrooms.....all make for a joyful vacation spot. The housekeeping was quite adequate. The property, specially the wooden beams in the living room, which were visibly wet, is in need of some maintenance. It would be shame to let such a beautiful property deteriorate. The last minute consternation, that you did not have a copy of the signed lease, even though it was mailed three weeks prior should have been avoided by better management. My wife and I recently spent several wonderful days at the Chapman Point Cottage. 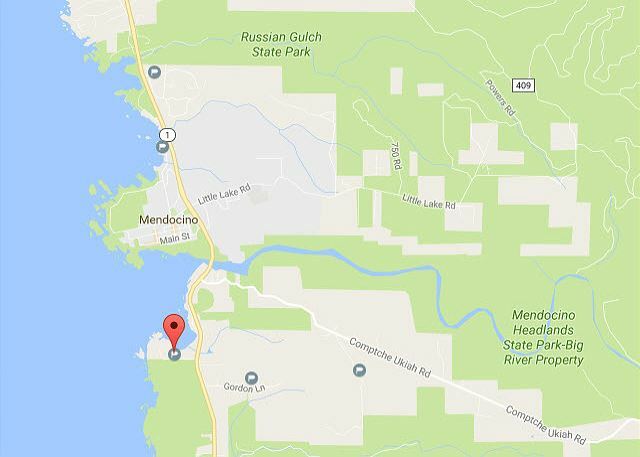 Located so close to Mendocino and some of our favorite places, yet hidden away on a wooded point. Perfect for two people, a really charming and relaxing place. Great kitchen facility and tasteful decor made it great to return to after a long day. Well maintained and spotlessly clean. we plan on returning this winter. Mendocino days on the Bay. I'm a several years client of Mendocino Preferred. I've stayed at three different properties. This time I chose Chapman Point Cottage. It's a perfect location for my visits and has everything needed including the outdoor spa. The property is private, quite, & serene. I strongly recommend this site. A delightful and comfortable little cabin that is well appointed. The relative location combined with its proximity to town lends the cabin to a privacy seeking patron. The bed was comfortable and the utilities were easy to use. All in all, a very positive experience that I would recommend to any of my friends. A great overall experience. The place was nicer than the online pictures would indicate. Very comfortable furniture and layout. We had a little trouble with the TV functions not matching written directions, but Mendo Preferred was very responsive and helpful with the problem. The Chapman Point Cottage was perfect for my boyfriend and me. It was the perfect amount of space and conveniently located. There was some confusion about picking up the paperwork after hours, but Mendocino Preferred Vacation Rentals made it right and sent over a bottle of champagne the next day. We had a WONDERFUL time! I loved this Cottage So Much, Everything about it was PERFECT...We brought all of our own food and enjoyed cooking on the BBQ and in the wonderful kitchen,you had every amenity anyone could think of. The Bedroom in the Loft DID have a more perfect ocean view than all your ads described, the bed was REALLY comfortable and we Loved being up in the trees. The Propane Heater was AWESOME and cozy and easy to use.. We Loved the Location, it was noise from the Highway and yet not too far away.. We were able to ride our Bicycles to Big River Park Trails, to Russian Gulch Trails, into Mendocino town, we only used our car once in 5 days and that was to go to dinner at Little River Inn on our last night..We also hiked the Spring Ranch Trail and down into Van Damme State Park..AND BOY did we appreciate the Washer and Dryer because after the Rains and all the Biking we were muddy..This was a PERFECT place and Getaway for us and WE WILL be back...Thank You So Much.. This is a beautiful cottage. The pictures don't do it justice. It's much larger than I was expecting from the pictures & it has a pellet stove I was totally not expecting. The kitchen is well appointed with pots, pans & utensils (coffee pot & grinder too!). We traveled with our two dogs (which many rentals charge exorbitant fees for) and had a great stay. The hot tub is nicely secluded. Even though the cottage is not far from Hwy 1, you can't hear the traffic at all. The bedroom loft has 2 closets for ample hanging storage. I do wish it had more shelving or 1 closet with a cubby for non-hanging items, but that's not really an issue. We were able to lay in bed & listen to the waves crashing on the cliffs that are just beyond. There was a wonderful greeting tray with a decanter of brandy & two dogie biscuits. There are a couple of very minor repair items, but the property is well cared for & management is extremely responsive. If our travels take us back to the Mendocino area again, I'd love to stay at the Chapman Point Cottage again. If you need something larger, the Chapman Point House is just behind the cottage & looks just wonderful with a stunning view. We had a wonderful time in Mendocino and we thoroughly enjoyed our stay at the Chapman Cottage. Great location. We had nice dinner with our doofus at Raven restaurant . My wife and I tried something new, outside of our normal B&B stay in Mendo. The area has always been a favorite (and is the town she agreed to marry me in)! We booked on short notice, brought out own supplies for a romantic adventure and we are so happy we did! The place was great, the rental staff so helpful and the weekend... Amazing! We will definitely look to this type of stay moving forward. A few things to note: Internet was not working while we were there due to a bad telephone line. There are no ocean views or ocean access so if you want that go for Chapman House which is right on the water. But, this is a great place to stay. It is close to town and river trails for hiking and biking. Very quiet. Beautiful cottage. We had a wonderful time in Mendocino. It was great to come back to this cottage after hiking to finish the day in the hot tub. What a lovely serene spot to get away from it all. The house is perfect and comfortable for 2...and soooo quiet! We especially love the private hot tub. Very nice loft home, with fully equipped kitchen and lots of space for 2 people. Great location. My only complaint is that the house smelled musty (I have allergies so I'm very aware of this). If you are looking for peace and quiet this is a great spot. This cottage has everything you need. On our arrival the place was spotless and inviting although you do not have beach access it is only a short walk or drive away.Only a five minute drive and you are in downtown Mendo. Stop and say hello to the staff super friendly and helpful. A great place I will defiantly return. Private and cozy, Chapman Cottage is as lovely as the photos suggest, immaculately maintained, and close to Mendocino, trails, wildlife and more. Quality linens for the bed and bath. Highly recommended. AWESOME, no complaints! THis is an amazing property and very close the ocean. You will love staying here! We had such a great time before, we decided to do it again. Just as great as the first. Love this property and the little things this management company does. The cottage was wonderful. The location was perfect, only a 5 minut drive from town but it was secluded and in such s beautiful location with trees all around. The Cottage itself was so comfortable, clean, cozy and nicely decorated. We loved staying there and will definitely go back. Chapman Point Cottage proved to be a wonderful place to stay for my 50th birthday/50-mile bike ride trip! The location was just close enough to Mendocino to bike in daily for morning coffee & pastry at The Good Life Cafe, yet far enough removed to feel peacefully secluded. Coastal roads aren't particularly bike-friendly (despite all the "Share the Road" signs), but nearby Alexander Valley was awesome for riding! Cottage was clean, warm & well-appointed. Outdoor hot tub was wonderful. We were pleasantly surprised to hear a back-up generator kick on automatically when a coastal rain & wind storm knocked out power for 2-3 days! I would suggest instructions be included on transferring power from city lines to generator for those who aren't familiar with that process. We Alaskans weren't phased, but others might be! I highly recommend Chapman Point! This was the cutest loft style home. Very warm and inviting. My and my boyfriend spent 3 nights there and we could have easily have stayed a week. We will be going back, that is for sure. We stayed here in September 2014. Great place for our family including our four-legged son. Loved the option of being able to cook meals, but was centrally located to Mendo Village and Little River as well. It was a last minute thing and Mendocino Preferred came through in accommodating my last minute guests. I could not be happier or more grateful. Not to mention, the place is fabulous!